Medication review, followed by reducing medications that increase fall risk. Checking blood pressure (BP) sitting and standing. This to make sure that BP isn’t overall on the low side (e.g. sitting systolic BP less than 120), and also that it’s not dropping a lot when the older person stands up. Gait, strength, and balance evaluations, often in collaboration with physical therapy. An evaluation often confirms that an older adult has poor balance and diminished leg strength. Doing exercises specifically designed to improve balance and strength, such as the Otago program, can counter this. Home safety assessment and modification, in collaboration with occupational therapy when possible. An occupational therapy evaluation usually needs to be ordered by a health provider, as part of skilled home health services. What about Vitamin D for fall prevention? I do still recommend that most older adults take a vitamin D supplement, however, I no longer particularly recommend it for fall prevention. Vitamin D used to be my fifth general recommendation for fall prevention. Even though it seemed the effect on falls reduction was small, at least it’s an easy thing to implement, and a daily dose of 800-1000 IU/day is extremely unlikely to cause harm. In 2018, the US Preventive Services Task Force recommended against Vitamin D supplementation to prevent falls in community-dwelling older adults. That is actually a fairly large group to exclude, given that both osteoporosis and vitamin D are fairly common. Since vitamin D is unlikely to cause harm and may help some older adults, I still recommend it, just not specifically for fall prevention. For more, see Vitamin D: the Healthy Aging Dose(Plus Answers to 7 FAQs). Review your fall prevention plan if you’ve fallen or been concerned! Perhaps the most important strategy to apply is to be proactive in getting help with falls. 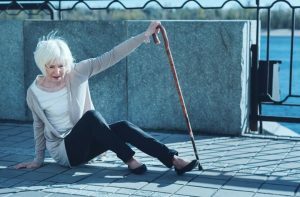 Research has found that older adults often don’t report falls to their health providers. Worse yet: when they do, health providers often fail to provide adequate evaluation and management in response. If you want to equip yourself to be even more proactive, you can learn more about how your health providers should be addressing falls on the CDC’s STEADI website. I’ve also recently compiled a Fall Prevention Resource Guide, click the link below to get your free copy of this PDF resource. It’s short and lists my top recommended online fall prevention resources, so that you have a way to find them fast. Get Your Free Fall Prevention Resource Guide! A handy short PDF to help you quickly find the key online resources mentioned in this article. Click here to download. With some gentle reminders from you and others, your health providers will do a better job helping you reduce falls. This article was revised and updated on 9/21/18. The post How to Prevent Falls: 4 Proven Approaches To Ask Your Doctor About appeared first on Better Health While Aging.